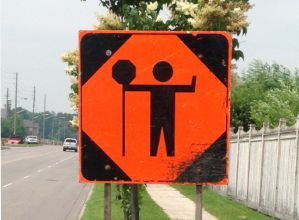 Construction and temporary signs are necessary when it come to presenting your message. We produce all types of construction and temporary signage to meet any budget, style and installation requirements. We would be happy to help you get your message out to an audience via a construction and/or temporary sign. Click on the construction and temporary sign images below to enlarge them. You can also view some of our sign work on our sign portfolio page.